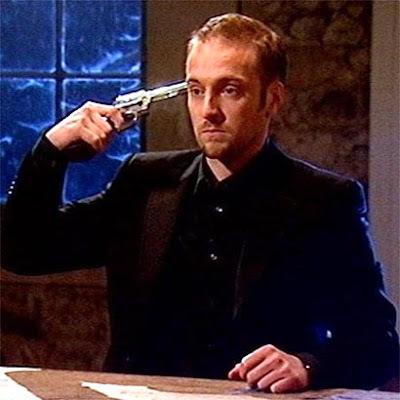 Derren Brown – Russian Roulette: How did he do it? Derren Brown is a world famous TV illusionist. Channel 4 call him a ‘psychological illusionist’. The ‘powers’ and methods he uses to create his illusions is widely speculated. In a recent programme aired on channel 4, he played Russian Roulette, using a contestant chosen from thousands that applied to load the bullet in the gun. Derren then claimed he could work out which barrel it was in. I believe the driving ‘power’ behind his skills in this episode are NLP. bear in mind here that with NLP, Derren is able to make his audience think what he wants them to think. The programme is edited to only show what he wants to show. nevertheless there are still some cues which show how he achieved this feat and managed not to shoot himself. At the start of the programme Derren is in the street doing an illusion trick with a member of the public. He asks him to place a bracelet under one of 4 cups, then turns back round and immediately guesses which cup, currectly. This trick is repeated with more cups, and in different ways. The member of the public tries and fails to trick Derren. The thing to note here is the voice, and the intonation of the voice. Derren will have spoken to the man before, off air. He will have deduced using language techniques as well as other methods, whether the man is suggestible, what his auditory inflections are, and his eye patterns. From all these signs combined, Derren will be able to tell what the man is thinking. This is a method that many salesmen use, in fact so do politicians. He asks the man to say the numbers 1 to 6 then guesses which cup he placed the bracelet under. Listen carefully to the man say these numbers. To the untrained ear, you may not hear anything, but listen out for any variations, pitch, intonation, perhaps expressions if the camera shows them. Can you read the signs, like Derren can? I am not sure what the contestants were expecting here, but Derren conducts a series of tests to eliminate the contestants down from 100 to 5, then to 1. He explains as he goes along, his reasoning for each elimination round. Think about this. You are going to rely on subtle non verbal communication signals from a complete stranger to ensure that you do not shoot yourself in the head. What kind of person are you looking for? This is exactly what Derren does, to select his final contestant. The man who when interviewed says he was glad he went out, because he didn’t want to think that he was suggestible, clearly didn’t understand how the whole thing worked. While watching all his little tests, watch the people carefully, and decide for yourself a few things that you think you have worked out about each persons character. Who is the ‘leader’? When it gets to the meal, and the cork game, I was able to deduce who would end up with the cork. I had, by this stage, worked out how Derren was operating, and what signs he was looking out for. See if you can guess, before you listen to Derren’s reasoning when he then gives his answer. Did you get it? NLP is not just about eye contact and hypnotic language patterns, NLP can be more subtle. Why do you think a good salesman can sell things by phone? They are listening carefully for the pitch and intonation as you talk, as well as the language patterns that you use. This is exactly how Derren achieved this illusion. I am not suggesting here that I had it all figured out beforehand and knew which barrel the bullet was in, but I did have a good idea of a couple of numbers of barrels that it was NOT in, as well as a couple of barrels that it could have been in. Listen to how he says the 6 numbers. The man at the start of the programme, when playing with 6 cups, said the numbers 1 to 6 too, which enabled Derren to work out the answer. On that occasion you can hear the inflection in his voice change dynamics and pitch just before the number that was the answer. The man probably didn’t even know that he was doing it. Similarly, you can hear it in the contestants voice, as he sits behind the bullet proof glass and recites the numbers. It is VERY subtle, but it is there. Derren also played a part in this too. We already established that the man was chosen because he was easily suggestible. Listen to how Derren words his instructions. He uses the number ‘one’ in his phrase. This is also no coincidence. only 10% of communication is through the words that we speak alone. Imagine how useful this would be as a tool, if you were in sales? Imagine how useful it would be in understanding relationships, be it professional or personal. I don’t necessarily agree with the fact that Derren Brown uses NLP in the way he does to stage grand TV illusions, but it does in fact illustrate how powerful the mind is, and how underused it it. It also illustrates how much we can learn, to create miracles of our own. To find out other ways that NLP is used, and how it can help, visit our coaching services page, or contact us to find out more.